Stamford, Connecticut, U.S.A. --- Further to our press release of March 30 regarding the arrest of Father ZHAO KeXun 趙克勛 of Xuanhua 宣化 diocese in Heibei 河北, we now report that Bishop YAO Liang 姚良, the auxiliary bishop of the diocese of Xiwanzi 西灣子 in Hebei 河北, was arrested on March 31, 2005. He is in his early eighties. Before his arrest Bishop YAO had been under mounting pressure from the Chinese authority to sever ties with the Pope and join the official Catholic Church (the Patriotic Association). However, the bishop refused to do so. The faithful in Xiwanzi diocese believe that his refusal to join the official Church could be the reason for his arrest. We do not know where he is being held. There are no further details. In addition, the Chinese authority is intensifying surveillance of the underground bishops. Bishop HAO JingLi 郝進禮, 89, the bishop of Xiwanzi 西灣子, and Bishop JIA ZhiGuo 賈志國, 71, bishop of Zhengding 正定, both from Hebei 河北, are now under 24-hour surveillance by the Chinese security bureau. We do not know the reasons for this intensified surveillance. In the meantime, news of the death of Pope John Paul II has reached the underground Church. Numerous Masses as well as novenas and other prayers are being offered for the repose of the soul of the Pope. An underground priest said that the Pope had never forgotten the persecuted Roman Catholic Church in China. Now that he is in heaven, the priest added, the Pope would most certainly intercede for the suffering Church in China so that those who have separated from the Pope will return to the one fold and one Shepherd. Another priest said that the Pope gave the underground Church in China vitality, energy, encouragement, hope and blessings. The Pope's canonization of 120 Chinese saints in 2000, the priest continued, must have significantly increased the power of his heavenly influence to save and bring to blossom the Roman Catholic Church in China. 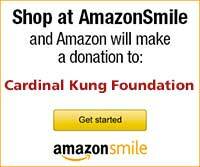 Joseph Kung, the President of the Cardinal Kung Foundation, said: "Since 1949, there have been thousands of martyrs in China because they refused to cut off their relations with the Pope, the Vicar of Christ on earth. Today, we still have numerous Roman Catholic bishops, priests, and other religious and faithful in jail because they will not sever ties with the Pope in order to join the Chinese government-established official Church or the Patriotic Association. Pope John Paul II said, "…..even in the most difficult times, the fidelity of the Catholic Church in China has never waned." As Pope John Paul II has taught us, we will maintain our fidelity to the Pope at all costs. To us in the underground Church, Pope John Paul II's death is not only the death of our Pontiff, but also the loss of a great father and friend of Roman Catholics in China. He loved the underground Church in China from the very beginning of his pontificate. He named Ignatius Cardinal Kung as a secret cardinal in the Pope's heart (in pectore) one year after he became a Pope in his first consistory and while Cardinal Kung was still serving his life sentence in the communist jail. 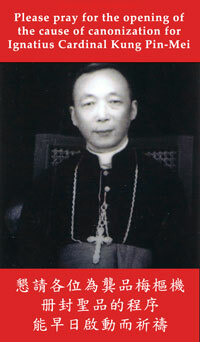 We believe that, because Cardinal Kung was a symbol of fidelity to the Pope and a symbol of Catholicism in China, the Pope carried Bishop Kung as a Cardinal secretly in his heart (in pectore) for 12 years before he was able to proclaim publicly Cardinal Kung as a cardinal to the world. Like a good father, the Pope not only offered his love to China, but also challenged and repeatedly encouraged and commanded his "children," the bishops in China, to keep the discipline of fidelity to the Pope, the Successor of Peter, and "to be the first witness of the faith which he professes and preaches to the point of shedding his blood." While dozens of countries, including Cuba, had welcomed the Pope's visit, the communist Chinese government rejected Pope John Paul II's dearest wish to visit China. We will firmly remember Pope John Paul II's teaching. We believe that Pope John Paul II will not forget the underground Church, even if he has died, because he will remember us in heaven. We will pray to him for his blessings on the underground Church and his intercession that there be true freedom of worship in China. We also pray to the Holy Spirit to guide the Church in choosing the next Vicar of Christ on earth, the Pope and the supreme leader of the Universal Roman Catholic Church, which must also include the Roman Catholic Church in China. In order to return Pope John Paul II's very deep love for China, we urge all clergy in the official (Patriotic Association) Church to express courageously their fidelity, love and obedience to Pope John Paul II and his successor by openly praying for and to the late Pope, and, as the Pope once said, "to maintain FULL communion with St. Peter's Successor."